If you’re serious about your tea, you know that the line between a perfect brew and over-steeped dreck is a fine one. Seconds can make a difference, and for the tinkering tea drinker, this might lead you to build a tiny timer with just the features it needs to achieve tea perfection. The circuit that tea-loving [acidbourbon] came up with for his timer is simplicity itself. It’s just an ATtiny25, an LED, two pushbutton switches and a piezo buzzer on one side of the PCB, with a coin battery on the flip side. The battery holder is an interesting design – a couple of rows of pin headers and a bit of springy metal. The user interface is as simple as the circuit – the buttons increment the time either one or ten minutes. The timer starts right away, the LED heartbeat counts down the seconds, and a distinctly British tune announces when it’s time for tea. One possible improvement might be to have the LED flash the number of minutes remaining rather than just a single pulse heartbeat. That would be good feedback that you entered the right time in the first place. Other than that, it’s small enough to be handy, does just one job, and does it well – sounds like good design to us. Of course, if you want to complicate it a bit, you could always automate the tea steeping process. [wejp] picked up an IKEA SPÖKA night light, but he wasn’t entirely impressed with its functionality. Pressing the top of the ghost’s head causes it to cycle through a few colors, and pressing it a second time locks it into displaying the current color until its tapped again. Inspired by this SPÖKA hack which used a different version of the night light, he tore his down to see what he could do with it. Upon stripping off the outer cover, he found that the internals were considerably different than those found in its glowing brethren, though they were perfect for what [wejp] had in mind. 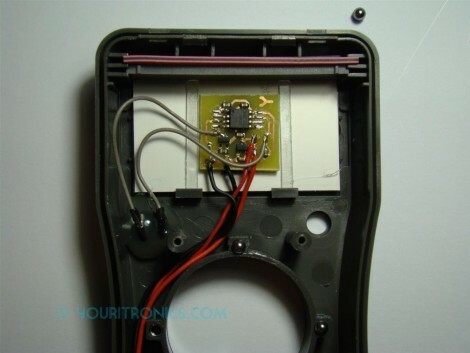 He removed the rechargeable battery pack as well as the controller board, which sits on a PCB separate from the LEDs. He replaced the stock micro with an ATtiny25, which he uses to give himself a bit more control over the light display. 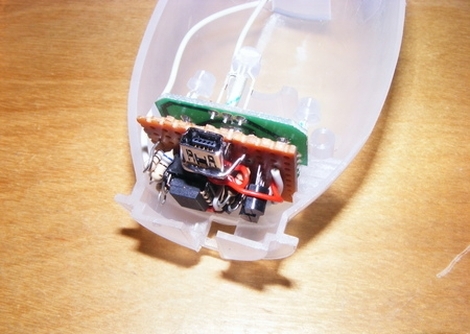 He couldn’t quite cram all the functionality he desired into the ATtiny, but he planned on powering the light using his computer anyhow, so he installed a small USB port in the back. When connected to his PC, the SPÖKA can be controlled more precisely than when it operates alone. Unfortunately there’s no video available of the SPÖKA light in action, but there are plenty of images available on his site. [Florin] picked up a cheap multimeter in order to make multiple measurements at one time. Unfortunately, he wasn’t very good at remembering to turn it off when he was finished so he burned through some batteries. Why an auto-off feature wasn’t the first thing coded into the firmware we’ll never know, but [Florin] developed his own hardware-based auto-off circuit. It sounds like he had all of the components necessary for this on hand already. He grabbed an AVR ATtiny25 in a surface mount package. To keep the board small, he didn’t include an ISP header, but instead made long pads that could have wires soldered to them for flashing the firmware. 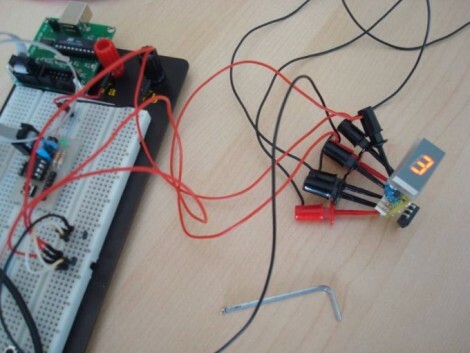 The microcontroller drives an NPN transistor that can cut off the ground path between the multimeter and its battery. A tactile switch is connected to one of the external interrupt pins and, when pressed, gives you 15 minutes of time to use the meter. After that, the chip kills the power and goes into sleep mode. Simple, and small enough to fit inside the case. [Vassilis Papanikolaou] just finished building a gear indicator for a motorcycle. This quite a simple implementation compared to some of the other vehicle information displays we’ve taken a look at. You should be able to build and install your own without breaking the bank. An ATtiny25 microcontroller reads data from a couple of hall effect sensors and the neutral switch, then displays the current gear on a 7-segment display. There’s a magnet on the shifter and two hall effect sensors at the position for ‘gear up’ and ‘gear down’ shifting. The AVR chip keeps track of these and even stores the last position in EEPROM when you shut the bike off. If the device somehow gets off track, it will automatically recalibrate itself next time you shift into neutral, thanks to the bike’s neutral sensor switch.